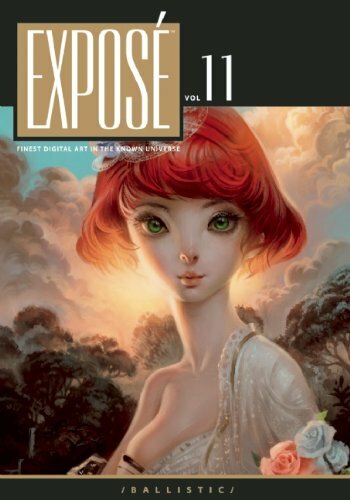 Another year, another brilliant volume of art from the EXPOSE series. Just like the previous volume, this one features 284 pages. There are three edition, the paperback, hardcover and limited edition. The price difference between the paperback and hardcover isn't too much. The limited edition is only available from Ballistic Publishing's website. This volume's grand master winner is Roger Dean. He's known for painting posters and album covers for musicians. Many of those covers feature exotic, fantasy landscape. He has an unique style and interesting choice of colours for his paintings. You can see more of his work in his art book Dragon's Dream: Roger Dean. 405 artists are featured which includes 200 new artists. That's plenty of work featured. The art is stunning as usual, as expected, of character designs, concept art, environments, sci-fi and fantasy. One thing I like about the collection series, EXPOSE and EXOTIQUE, is they use a lot of judges (13 in this case) to ensure that the quality of work featured is high throughout. My favourite sections are still the matte painting, environment and architecture. There's also an additional section on digital 'plein air' painting with a short writeup on Robh Ruppel and the advantages of painting outdoors. Robh Ruppel is the art director of Uncharted 2, and the (art book is also published by Ballistic Publishing). One quibble I had is that the grand master image for the Portrait (Rendered) by Siamak Roshani was printed across the page gutter. The nose is in the gutter and that is definitely not the best way to present a winning illustration, especially for a portrait. It's still an awesome book. Same can be said for other books in the series. Roger Dean is the grand master in this volume.